St. Vincent and the Grenadines made sure that as innovators of the Independence Cup Football Competition they became the inaugural holders of the challenge trophy. 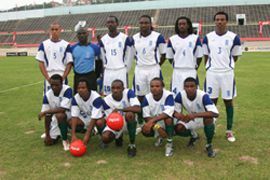 They beat Grenada 4-1 in the opening fixture last week Wednesday night. First half braces from Shane Glynn and Shandell Samuel gave the Vincentians the first half cushion. St. Vincent and the Grenadines formalised their hold on the title with a 2-2 draw with Antigua and Barbuda last Sunday night. The Antiguans needed to win against the Vincentians after they drew 1-1 with Grenada on Friday night in a dour encounter. Last Sundayâs finale turned out to be one which the referee took center stage in preference to the players. The match was set up for an epic battle when in the first minute Andrew Douglas poked the ball in the net from a looping left side cross, to give St. Vincent and the Grenadines the lead. Poor communication in the Vincentian defence let loose the brawny Peter Byers who slotted the ball past goal keeper Winslow Mc Dowald to give Antigua and Barbuda the equalizer in the 8th minute. The lead was regained by the Vincentians when Darren Francis scored in the 17th minute after the Antiguan defence failed to clear. But luck was to come the visitorsâ way when referee Lyndon Moss awarded them a penalty for a questionable foul against defender Greg Myers in the 21st minute. Myers doubled his tally scoring from the spot. From that point the match deteriorated into a a lack lustre affair. And on a night that spectators will always remember, Moss signalled the end of the match in the 28th minute of the second half, only to have it restarted on the intervention of the fourth official Timothy Hazelwood. Both teams missed easy opportunities after the second resumption, with substitute Marlo Marshall mis-directing a header with seconds on the clock which would have given the home team maximum points. St. Vincent and the Grenadines ended with four points, Antigua and Barbuda three and Grenada one point. It was a competition which local officials will prefer to forget, as there was a late start to the opening encounter, when Hazelwood queried the dimensions of the penalty area. Incidentally, the dimensions of the field have been in use since the Guinness Inter League competition began August 18. The Independence Cup which is supposed to be an annual affair was used as a warm up by Antigua and Barbuda and the host, who are into the second round of the Digicel Caribbean Cup. Antigua and Barbuda are drawn in Group H along with host Guyana, Guadeloupe and the Dominican Republic to be played from November 24- 28. St. Vincent and the Grenadines compete in Group G with Bermuda, the Bahamas and Barbados on the latterâs turf November 19-23. Group I began last Wednesday and ends this Sunday in Martinique involving Cuba, Suriname, Haiti and the host. The two top teams from each of three groups will advance to the finals in Trinidad and Tobago next year. As host Trinidad and Tobago are automatic qualifiers while the eighth team will come from a play off round among the three third place finishers from the second round.